Much waited OBIEE 12c is released. This version is another major release from Oracle after OBIEE 10g and11g. This version has many improvements, Enhancements, and advanced new features in installation, migration, analyses and dashboards, Oracle BI Mobile, Oracle BI Publisher, metadata repository development, system administration, integration and API, and localization. Visual Analyzer: A brand new powerful visualization application in OBIEE Suite. VA provides greater flexibility to Rapidly create rich analyses through drag-and-drop configuration of new visual grammar. Using VA we can build the reports from the sources OBIEE repository and also from external content. Views Enhancements: New context menu (Right Click) on all graphs & other views to sort, drill. New Heat Matrix view type to represent the two-dimensional data. This is well suited for analyzing large amounts of data and identifying outliers. Logical Level Sequence Numbers for Time Dimensions for faster time series calculations. And to improve the query time. Installation: Much faster and straight forward. And mostly, the configurations & folders directories are simple and clean. NO more OPMN, all services including OBI System & Java services are managed by WebLogic. Migrating from OBIEE 11g to 12c: We can migrate the Oracle BI 11g metadata to 12c is a two step process, and is carried out by using the BI Migration Script (migration-tool.sh). The catalog and WebLogic Security configurations needs to be reconfigured/migrated like in OBIEE 11g. BAR (BI Archive file): A new archive format which contains OBIEE Catalog, RPD and Security packaged in one file. The file will be created in current environment and imported in Target environment. The BAR file creation process has following options while creating it. export all: To export everything including users and data sources are the same between two systems. export without user folder content: Migrating the Catalog without the User’s Folders. export without connection pool credentials: Migrating the upgraded RPD from one environment to another without connection Pool information. When Imported the BAR in Target environment, The RPD will be updated the new changed by not changing the Target System Connection Pool Information. BISystemUser and BISystem Removed, No need to have BISystemUser in LDAP. The system user concept is now deemed “virtual” and is represented by the credential oracle.bi.system/system.user, for which the values are securely randomly generated by the Configuration Assistant. Database Security Store: Policy & Credential store is configured in database instead of the file System-jazn & etc. Easier SSL Configuration: Configuring SSL is much easier than earlier versions. Overall this is a great release after OBIEE 11g from Oracle. Best version to start exploring and do great analysis. Stay tuned for more interesting articles on OBIEE 12c here. NOT supported on 32-bits Operating Systems. Improved Aggregate Persistence wizard to generate the aggregates with levels auto-correct and etc. Selection Steps & Hierarchical columns can be override with the initialization blocks with its initialization string written in JSON syntax. HTML5 output is supported and can be configured as default output format. So flash limits will not stop your analysis on any devices. More settings to configure the exports: columns formatting, Width, No.of rows etc.. Better and simple UI (skin & Style) customization with a centralized master CSS and images in one directory. Improved Scheduler WebService methods gives more flexibility to manage the OBIEE Agents programmatically. In today’s technological landscape there’s an ever-accelerating demand for increased efficiency and effectiveness. As organizations evaluate new solutions, they must consider the effective end-user adoption of every technology prior to implementation, particularly as the cost of deployment and training are often driven by the rate of user adoption. So every organization requires a careful evaluation of the tool, as well as its potential for end-user adoption. To enable all users to tap into the most pertinent data, whenever and wherever they need it, Oracle has introduced, Oracle BI Cloud Service. The new Oracle BI CS is familiar with the users of OBIEE 11g. In some areas, Oracle BICS provides nearly identical features and functionality to Oracle BI EE. 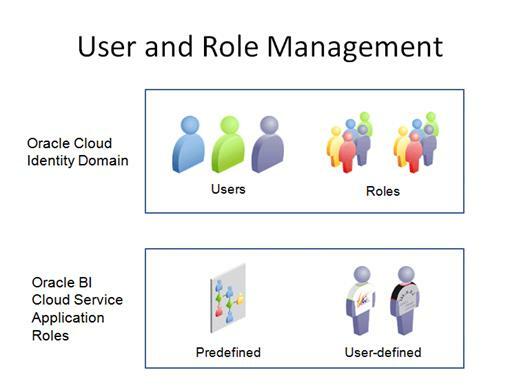 These similarities enable users to become more productive more quickly using Oracle BI Cloud Service. That said, you don’t need any special skills/training, just your current OBIEE analyzing and visualizing hands on skills are enough to adopt this new BICS. Oracle BICS is designed with a fresh, lighter weight UI by integrating a new style called Skyros. It is exciting to see how quickly oracle is enhancing BI capabilities and visualizations components that provide significant graphical and tabular capabilities for analyzing data. In that direction, Oracle BI CS is being modernized and introduced following new features/components (in this V1 release). Treemaps organize hierarchical data by grouping the data into rectangles (known as tiles). Treemaps display tiles based on the size of one measure and the color of the second measure. 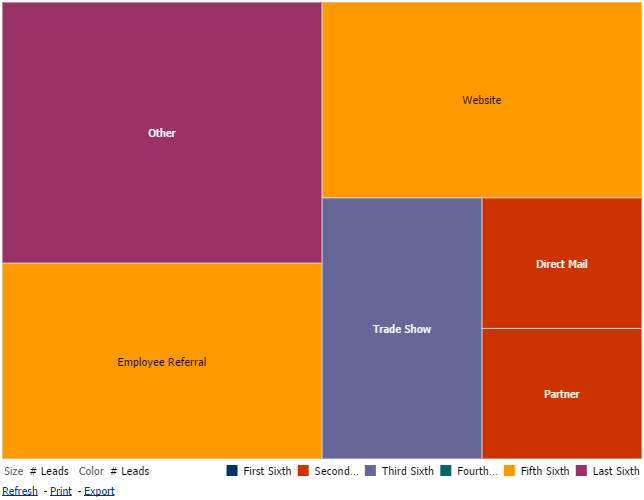 The following figure shows an example of simple treemap view. It shows the rectangles space filled with the “Size” and “Color” proportional to the “#Leads” across different Lead Sources. By default, the first measure of the analysis in the Criteria tab is selected as the Size By measure, and the second measure is selected as the Color By measure. If there is only one measure in the analysis, this measure is the default for both Size By and Color By options. Additionally, the Style element defaults to Percentile Binning with “quartile” as the value for the number of bins. Tiles are colored by percentile binning or continuous color fill. First Group By dimension is displayed as the group (header) label. The order of the Group By dimensions implies the nesting order within the treemap. The last dimension in the Group By is the lowest level and this dimension name is displayed as the tile label. If the label is too long to fit on the tile, then it is truncated. Full values for the labels display in the tooltip. In addition to session, Presentation and Request variables, BICS introduces a new variable called Global Variables. A global variable is a column created by combining a specific data type with a value. The value can be a Date, Date and Time, Number, Text, and Time. You create a global value during the process of creating an analysis by using the Edit Column Formula dialog. The global variable is then saved in the catalog and made available to all other analyses within a specific tenant system. The global variable is evaluated at the time the analysis is executed, and the value of the global variable is substituted appropriately. where variablename is the name of the global variable, for example, gv_region. When referencing a global variable, you must use the fully qualified name as indicated in the example. Note: Only users with the “BIAdvancedContentAuthor” role can manage (add, edit, and delete) global variables. Oracle has release new Oracle has introduced Oracle Business Intelligence Cloud Service (BICS) and now it is GA and available for subscriptions. Now With the advent of Oracle BICS, You can bring critical analytics to those who need them and can use the information to improve business operations when it counts, and not have to learn of problems weeks and even months after they appear, as is the case with many traditional BI systems. And Over the past few weeks I have been participated in Oracle BICS beta program. And, evaluated various real world scenarios and possible deployment options. 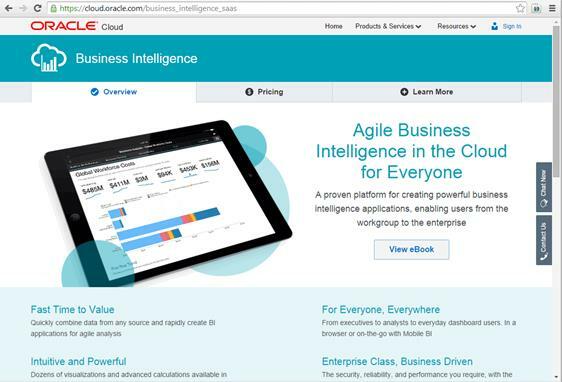 The Oracle Business Intelligence Cloud Service (BICS), a part of Oracle Analytics Cloud, which offers the most comprehensive analytics cloud suite on the planet. With built-in mobile capabilities, Oracle BI Cloud Service helps speed and improve decision-making across the organization by lowering the barrier to entry for users providing secure, comprehensive information access with the simplicity and cost-effectiveness of the cloud. Oracle BICS is the industry’s first BI platform in the cloud that makes analytics available to everyone, from the workgroup to the enterprise. BI Cloud Service endues users of any skill level, from any department, to easily combine data from diverse sources and quickly create rich, interactive analytic applications and reports. Based on Oracle’s proven BI technology, it helps users to quickly create rich, interactive data-driven insights and data visualizations to users throughout an organization. Integrated with industry-leading Oracle Database Cloud (At this moment, this is a Schemas-as-Service). BICS is optimized for the cloud and empowers users to combine data from diverse sources, including other cloud solutions, as well as on-premises and third-party applications. There are multiple ways to load data, from importing files self-service to ongoing data integrations, including web-based file loading, direct queries, ETL integrations, a REST API, and more. Built-in Mobile capability. It provides better support for device-delivered information, such as to dashboards or reports intended for smartphones and tablets. The service simplifies both the preparation of data for reporting and the creation, management, and deployment of analyses. The service offers many self-service capabilities such as loading your data and creating reports for your line of business. Most importantly, it is secured with industry’s highest level security standards (SSAE 16 Type II Certified). SaaS model – Oracle Managed Patching and upgrades (you don’t need to chase the patches. now they are just automatic for you). The Oracle BI Cloud Service is offered as-a-service subscription model rather than a huge one-time purchase cost. So customers can deploy this right away, to small groups, business departments, or the entire organization, with no capital costs. The new Oracle BICS has togged with all the features of OBIEE 11g and newfangled cloud-native developer tools to model, integrate and analyze your data. 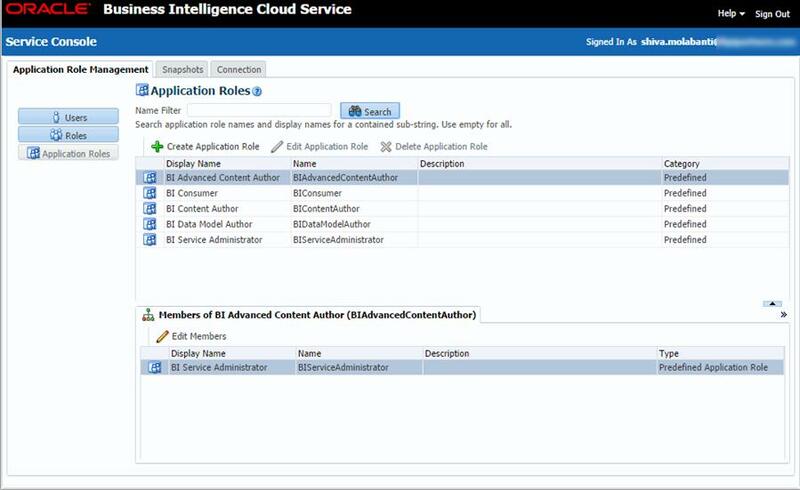 Currently BICS does not include other OBIEE components: BI Publisher, Delivers, Essbase, Smart View, MapViews or Invoke Actions. Quick to start: With simple, wizard-driven data import and data model introspection, business users can build analyses, BI applications, or data mashups, without any programming or specialized analytics skills. Easy to adopt: An interactive user interface with integrated guidance and tutorials improves productivity and adoption. Users with prior knowledge of Oracle BI can utilize the service right away, without retraining. Cloud-based industry best practices will also be included. Mobile: Built-in mobile capabilities offer analysis on-the-go, including touch, drill, and interact features, with no additional development necessary. Additionally, Oracle BI Cloud Service is equipped for offline use, with fine-grained security to manage access and visibility. Flexible: For more custom queries and data-loading choices, users can leverage programming interfaces for deeper integration. How secure is the Oracle BICS? 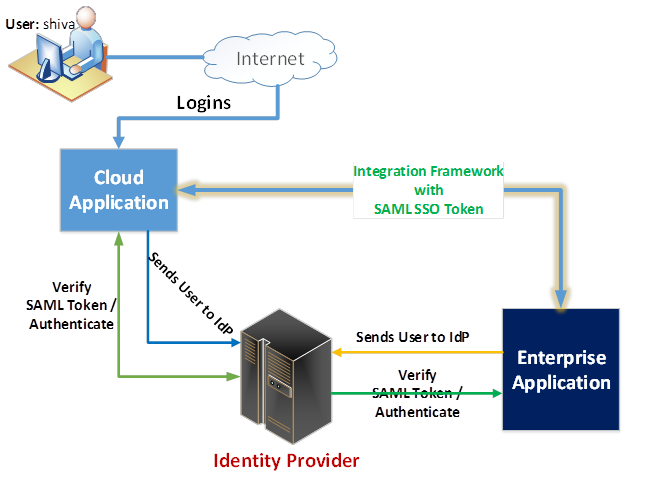 Oracle BICS is built on Oracle’s Identity Management platform. And BICS is multi-tenant and so every subscription is identified with its Identity Domain. The Identity Domain specifies the Company tenant ID. When a user registers, their account and credential information is stored in Oracle Internet Directory. 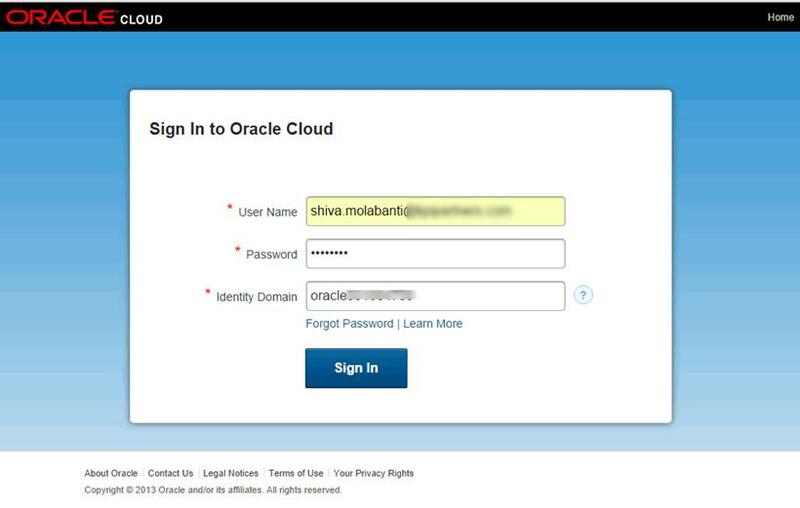 When a user has access to several services across Oracle cloud, the single sign-on is handled by Oracle Access Manager. When a user account is disabled, it can be disabled across all services. 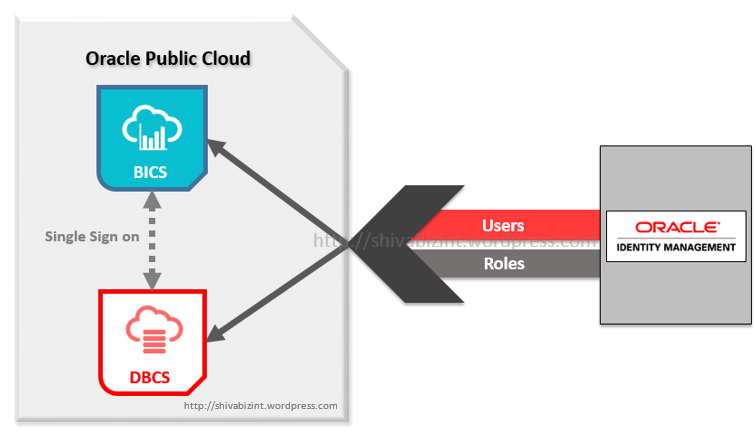 The Identity Management is part of the Common Services layer and secures Oracle Public Cloud services. And Data is stored in the Oracle Database Cloud Service which is hosted in the Oracle Public Cloud. 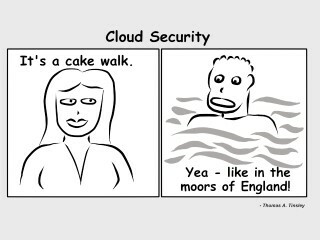 The Oracle Database is well-known for its data security, and the Oracle Cloud keeps your data completely isolated from that of other companies. Oracle Cloud services also offer market-leading security features – including encryption, virus scan and whitelist support. Oracle Cloud data centers offer embassy-grade physical and logical security. The services employ management controls, operational controls, and technical controls and are aligned with the security framework of ISO (International Organization for Standardization) and IEC (International Electrotechnical Commission), specifically ISO/IEC 27002:2005, Code of Practice for Information Security Management and ISO/IEC 27001:2005 standards. Scalability: The cloud-based model allows organizations to add new users and applications as requirements change. Availability: Oracle Cloud delivers high availability, while Oracle optimizes speed by offloading analytic workloads to the cloud. Security: Data and BI applications are part of the Oracle Cloud, which meets the industry’s highest security standards and is completely owned and operated by Oracle, helping ensure data does not travel to third parties. Simplicity: Oracle manages patching and upgrade cycles, further freeing up IT resources and ensuring immediate availability of the latest capabilities. Elasticity: The service offers the power of the Oracle Database and sophisticated Oracle BI capabilities to support current and future comprehensive analytic needs. We can subscribe Oracle BICS monthly. Each subscription has been offered with two independent environments (Pre-Prod and Production) with separate Database and BI Service. We all know how to purge OBI Server Cache to see the reports with the most up-to date data from recent ETL. The most common job we do for this is “Cache Purge”. There are several ways to Purge OBI Server Cache: for e.g. : with ibots/Agents bursting, Dynamic repository variables or with our own nqcmd command. Either that, or it means we can script the process and run it periodically. However, to execute these commands in any automated process, you have to depend on another app/skillset and you need to be compromised at security to access OBIEE Server. Because some of the OBIEE command line statements can’t be executed external to the Server. To do this either you need be compromised at OS security level or you need to setup the sshpass (password-less login). But many organizations will not support this in ther Production environments due to various reasons of password sharing or bypassing limitations. And this has been a must have attempt in 90% of OBIEE implementations that we have seen till now (At least in my case). So to address this issue, I am very excited to tell you guys that I have developed a simple handy tool. This is completely free for you for the benefit of OBIEE Community…. Using this, you can simply Purge or seed the OBIEE Server Cache remotely. Yes, you don’t need to login to OBIEE server or Application. You can simply do that from your own system. Only thing that you need is that you should be able to ping the OBIEE hostname/ipaddress on BI Server port (e.g: 9703). That’s it, you are done. Pre requisite: Make sure you have Jdk 1.6+ installed in your system. I have created two versions of BICachePurge v1.0 utility for both Windows and LINUX/UNIX Operating Systems. Unzip the downloaded file into a directory of your choice. Now, navigate to the BICachePurge_v1.0 folder. In the BICachePurge_v1.0 root folder, Open the BIS_Param (BIS_Params.bat for WINDOWS and BIS_Params.sh for Linux/Unix) in a text editor. And now, edit the following variables to reflect the OBIEE server where you would like to purge the cache. Note: All the variables are mandatory and so make sure to setup all of them. And if you have any spaces in the values, then add that in quotes (“). For eg. “call SAPurgeAllCache()“ and DON’T FORGET TO SAVE. On windows: open a DOS command prompt and navigate to <install drive>/BICachePurge_V1.0 and execute Purge_Cache.bat command. On Linux/Unix: on command line, Go to <install drive>\BICachePurge_V1.0 and execute ./Purge_Cache.sh command. OK, Now how it helps to automate the Cache Purge/Seed process? Hmm, you can use this code in different ways. You can purge the OBIEE Server cache from your own system without logging into OBIEE online RPD or Presentation Services. You can use this in crone job on server to do this on regular interval of time if you wish to. You can execute this from your own ETL servers (for e.g. : from DAC server to execute it as POST Task). Enjoy guys!!!.. And feel free to give your feedback and do let me know if you have any issues in installing this.